Catch of the Week: Jerry Matthews from San Diego, CA landed this monster while fishing the North Shore. It was a 5 pound 2 ounce Rainbow caught with a Rapala. 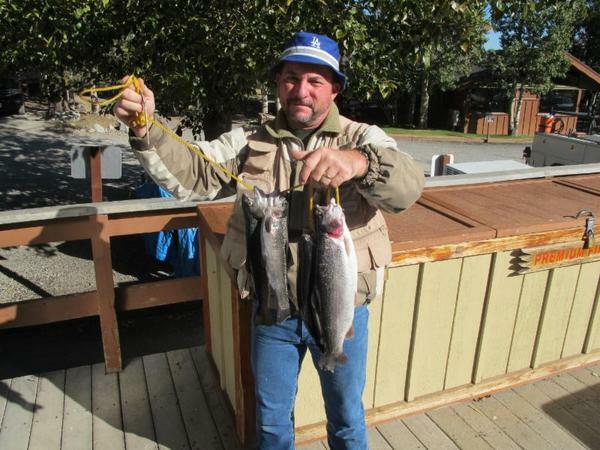 Mark Wheeler of Bakersfield, CA with a stout 4 pound 11 ounce Rainbow. He caught it at the Inlet with Garlic Powerbait. Donna Garcia from Big Bear, CA caught a fat 3 pound 3 ounce Rainbow. Donna landed this Rainbow at the Inlet with a Nightcrawler. Jeff Hull of Santee, CA hooked a 2 pound 6 ounce Rainbow. He landed it at the South Shore with an Artificial Nightcrawler. 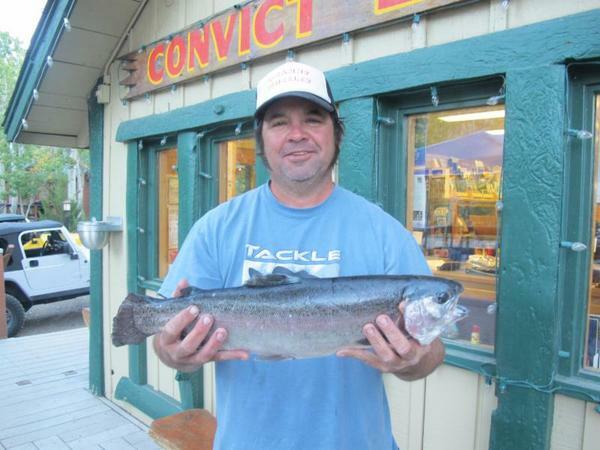 Matt Pyles from Corning, CA landed this 2 pound 6 ounce Rainbow while fishing near the Inlet. Matt was fishing with Nightcrawlers. Tactics/Bait: A number of lures and jigs produced this week. Try tossing Tasmanian Devils, Rapalas, artificial Nightcrawlers and Mice Tails. The most successful Powerbait colors were Rainbow and Green. Use the Garlic scented Powerbait. Nightcrawlers and Salmon Eggs also worked well. The South Shore was the hottest spot this week. Other locations fishing well were the Inlet, Outlet, North Shore, the Handicap Pier and Hangman's Tree. Here is a list of other baits/lures that can be productive: Panther Martins, green or brown Marvel Fly Lures, Kastmasters, NeedleFish, Roostertails, and garlic scent on Powerbait. Weather: The forecast for the start of next week is calling for cooler temps and a slight chance of showers. The high temps starting Monday will be in the mid-50s and the lows will be in the high-20s. Here is the National Weather Service link that is usually quite accurate: 7-Day Forecast Convict Lake. Sunrise - Sunset: Sunrise this week 6:52am - 6:57am and Sunset 6:40pm - 6:31pm. 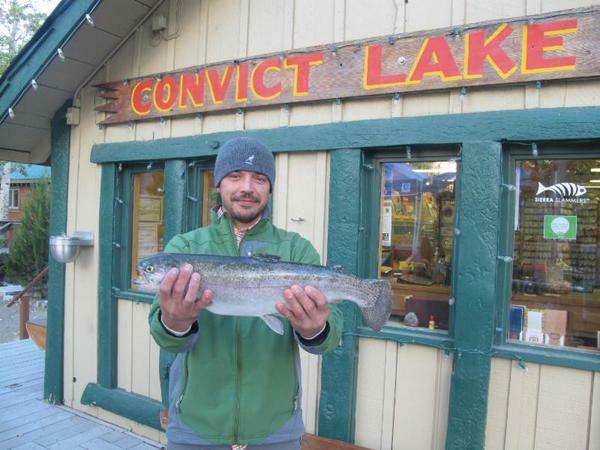 Stocking: The resort is stocking trophy trout today. The DFW is scheduled to plant both the lake and creek the week of October 9th.